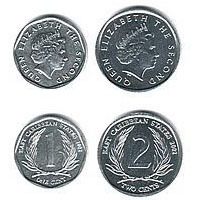 A public education campaign under the theme “Less Cents Makes Sense” will be launched in the coming weeks, as part of the Eastern Caribbean Central Bank strategy to educate the general public about its decision to stop issuing 1¢ and 2¢ coins. In the lead up to the launch of the campaign, officers from the Bank have been holding educational seminars with various stakeholders to enlighten them about the new rounding process that will occur when the 1¢ and 2¢ coins are removed from the market. These stakeholders include the media, the banking sector and the business community. Director of the Currency Management Department, Mrs Pamela Osborne, told the media during its educational seminar that the system will see payments in cash being rounded up or down to the closest 5¢. “Transactions involving 1¢, 2¢, 6¢, and 7¢ at point of sales will be rounded to the closest 5¢ downward, while transactions involving 3¢, 4¢, 8¢, and 9¢ will be rounded to the closest 5¢ upward,” she said, while explaining that customers only total sales will be rounded, and not individual items. Osborne further explained that transactions involving payment using credit and debit cards will not be affected. “These payments do not involve the use of actual cash in the transaction, and so it should not be reflected in the payment,” she said. The ECCB says that 1¢ and 2¢ coins will not be issued as of 1 July 2015, but persons will have up to 5 years to redeem them at local banks. Since 1983 the ECCB has issued more than 800 million of those coins, and they are hoping that by the end of the 5 years most of the coins will be returned. ‘At the end of that period we will review the situation and decide if we need to extend the deadline or express satisfaction with the returns,” said Deputy Governor Trevor Brathwaite. As part of the campaign, all places of transaction will have to display the price-rounding guidelines in a prominent location for customers to see and read; there will be training of cashiers in all the islands, and use of all forms of traditional and trending media to educate and enlighten the general public about the new system of payment. Brathwaite said the rounding system is not new to the Caribbean, because the Barbados Central Bank already implemented that policy in 2014 by eliminating the use of their 1¢. Canada also stopped issuing the 2¢ in 2013, while the Netherlands instituted the measure in 2004. “What we learnt from these territories is that there will be some teething difficulties… but we are confidenct it will resolved quickly,” said Brathwaite. “What I can tell you is that it costs 6¢ to produce 1¢, and 8¢ to produce 2¢, so it costs the Bank more than the face value to produce each one,” he said, noting that 17 million coins are issued per year.